NEW! They're back and better than ever! 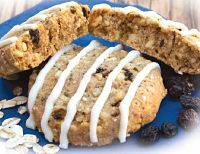 Chewy, delicious, and packed with protein, the Oatmeal Raisin Cookie with Icing is a tasty treat any time of day. Try heating in the microwave for a few seconds for a fresh-baked taste. Now with a drizzle of vanilla cinnamon icing for a bit of extra sweetness!